The sun is the main source of energy for the development of biomass and the operation of the processes of life on our planet. The sun's energy is emitted in the form of electromagnetic radiation into space and strikes in different wavelengths onto the earth. The human eye usually perceives light in the wavelength range of 380-780 nanometres (nm). Like the human eye has a light perception and sensitivity, plants have their special sensitivity curve for photosynthesis. Plants absorb the portion of light in the wavelength range of 400-700 nm. The photosynthetically active radiation is abbreviated as "PAR". The most important of these processes is the photosynthesis: the basis for plant growth and development. More simply, it is a process that all plants use, to collect the energy from the sunlight. The plants store the collected energy as carbohydrates, so that the sunlight basically serves as food for the plant. The light is absorbed with the aid of the pigment chlorophyll. The two most important chlorophylls are chlorophyll A and chlorophyll B pigments as well as other auxiliary pigments, such as the carotenoids. As seen in Fig. 1 chlorophyll A absorbs the light in the blue and red wavelengths, with absorption peaks at 430 nm and 662 nm. Green and far-red light however, are little or not absorbed. Chlorophyll B uses a similar range, with absorption peaks at about 453 nm and 642 nm. 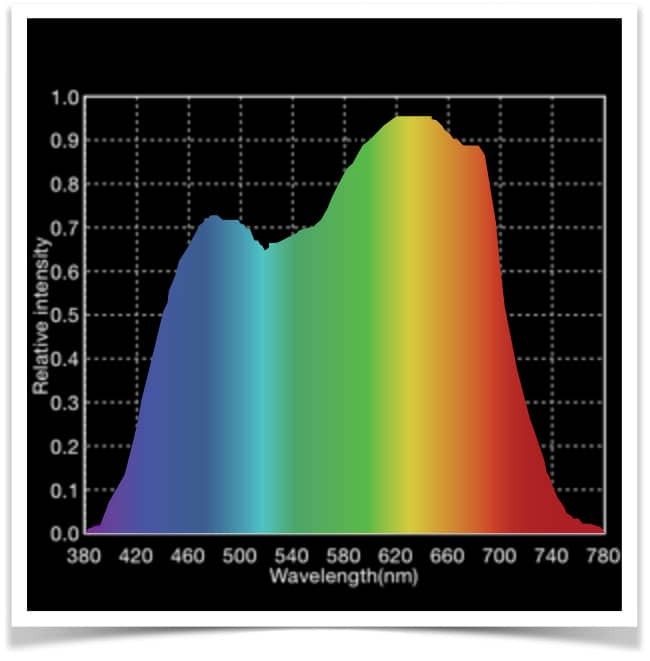 Auxiliary pigments, as shown here the beta-carotene, use smaller portions of the light spectrum with absorption peaks at 400-500 nm. Chlorophyll A is the main pigment the conversion of CO2 into carbohydrates. The auxiliary pigments transfer the absorbed energy on to chlorophyll A, in fact they only widen the action spectrum. The action spectrum is the sensitivity curve of the light on plant's photosynthesis. In order to make accurate statements about the light absorption of different pigments, scientists undertook a complex measurement process using a spectrophotometer where each wavelength was tested for the specific absorption rate. The result of the activity of main pigments and auxiliary pigments is shown graphically in the action spectrum (Fig. 2). ￼￼Comparing the action spectrum (Fig. 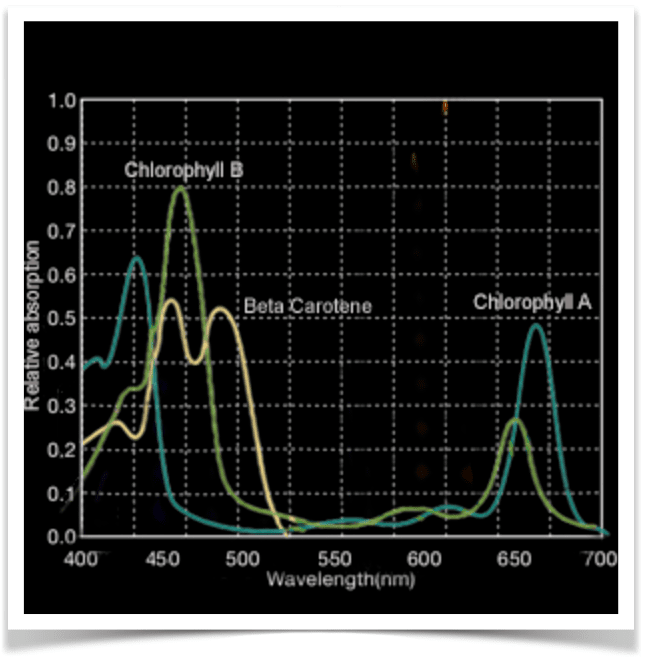 2) with the corresponding absorption spectrum of chlorophyll A (Fig. 1), you will note that they do not match. In fact, the absorption spectrum leads to the conclusion that photosynthesis is primarily driven by blue and red light (and the least by green light). Whereas the photosynthetic action spectrum will tell us where the average of all Chlorophylls are absorbed most strongly. Many people wrongly apply the absorption spectrum curve to determine the optimal light spectrum and assume that only red and blue should be used primarily. This is not exactly true, because a broader light spectrum is far more effective than a narrow-banded light spectrum (eg. only blue and red). Especially in the indoor environment, when individual colors are emitted with very high intensities, the plant can reach a light saturation and only a small part of this light is processed. In greenhouse operations, blue and red are a good addition to the broad sunlight spectrum. Photomorphogenesis is the influence of light on the shaping of the plants. A large proportion of light in the blue spectral range leads to short and bushy plant growth with short internodes. In contrary, a high concentration of the red spectrum lets your plants grow tall and with few side branches. What is the capability of a excite Grow Light in this area? Example: Let your plants first grow short and bushy with a extraordinary tight internodes and from 2nd bloom week, expose them to the full red spectrum for maximized yield. Photoperiodism the phenomenon that plants respond differently to the length of the light and dark periods. Some plants induce blooming only when duration of daily exposure is below a critical value (short-day plants); while others induct flowering only when the daily light is above this critical value (long-day plant). The process of photoperiodism is also influenced by the wavelength of light. Red light brings the phytochrome to an active form. The active phytochrome reaction basically wakes the plant up in order to start photosynthesis and is also referred to as Pr (phytochrome red). Infrared light triggers the inactive phytochrome reaction, also called Pfr (phytochrome far red). In the inactive Pfr form, the plant goes to sleep. During the dark period, the plant regenerates and develops flowers. Invisible to humans, UV light is divided into three types: UV-A, UV-B and UV-C.
UV-A is in the wavelength range of 315-400nm and is mostly transmitted through the atmosphere before hitting on earth. UV-A was not an important key to photosynthesis for scientists for a long time1. Recent studies have shown that UV-A radiation's positive effects on the growth and flowering of plants2,3. This means that rays outside the PAR spectrum are impacting the fundamental photosynthesis processes. Certain plant species may benefit from UV-B. During the flowering phase, the production of potent flowers can be accelerated7. 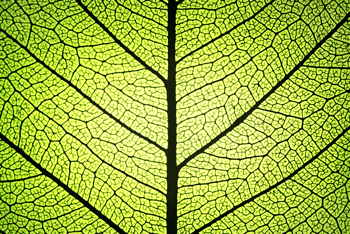 Due to the cell damage by UV-B the plant attempts to protect exposed cells by increased resin production. UV-B rays should ideally light sideways onto the plant and not from the top, in order to minimize the damage to the plants. For this method, we recommend to use a time-controlled T5/T8 UV-B lamp for max. 3-4 hours during the last 3 weeks of flowering. UV-C is far away from visible light at 200-290 nm. Very little UV-C radiation passes through the atmosphere, therefore is was not considered to be important for bio-organisms in science. The blue-violet and blue range of the light has a wingspan from about 400-520 nm. Wavelengths in the blue region are fundamental drivers of photosynthesis.8 The more light plants receive from the blue-violet and blue spectrum, the greater will be the leaves. Blue wavelengths take a crucial role in the development of chloroplasts.4 Chloroplasts are the portions of the leaf cells containing chlorophyll and engage in photosynthesis. Blue light has a variety of important roles in the photomorphogenesis of plants, including the regulation of the stomata9, water balance and CO2-exchange, the natural form development10 as well as control of phototropism11 (light sensitivity). 1 Caldwell M. (1971): Solar ultraviolet radiation and the growth and development of higher plants. In: Photophysiology. Academic Press, New York. 2 Yao X., Liu Q. (2006): Changes in morphological, photosynthetic and physiological responses of Mono Maple seedlings to enhanced UV-B and to nitrogen addition. 3 Barta C., Kalai T., Hideg K., Vass I., and Hideg E. (2004). Differences in the ROS-generating efficacy of various ultraviolet wavelengths in detached spinach leaves. 4 Zheng, J., Hu, M., & Guo, Y. (2008): Regulation of photosynthesis by light quality and its mechanism in plants. 5 Strid, A., Chow, W., & Anderson, J. (1994): UV-B damage and protection at the molecular level in plants. 6 Fernando J., Fernando H., António E., Maria Manuela A., Maria Paula Duarte & José C. Ramalho (2012): Impact of UV-B radiation on photosynthesis – an overview. 7 Lydon, J., Teramura, A., RH, & Coffmann, C. (2008): UV-B Radiation Effects on Photosynthesis, Growth and Cannabioid Production of two Cannabis sativa Chemotypes. 8 Hogewoning, S., Trouwborst, H., Maljaars, H., Poorter, H., van Leperen, W. & Harbinson, J. (2010): Blue light dose–responses of leaf photosynthesis, morphology, and chemical composition of Cucumis sativus grown under different combinations of red and blue light. 9 Schwartz, A. & Zeiger E. (1984): Metabolic energy for stomatal opening. Roles of photophosphorylation and oxidative phosphorylation. 10 Cosgrove, D. (1981): Rapid suppression of growth by blue light. 11 Blaauw und Blaauw-Jansen, (1970): The phototropic responses of Avena coleoptiles. 13 Eskins, K., (1992): Light-quality effects on Arabidopsis development. Red, blue and far-red regulation of flowering and morphology.